In 2013 and early 2014, the political crisis in Thailand escalated again, combined with mass demonstrations and violent street protests. In May 2014 the removal from office of Prime Minister Yingluck Shinawatra by a Constitutional Court´s verdict was immediately followed by a military coup. A National Council for Peace and Order was formed, headed by General Prayuth, who has been appointed Prime Minister. The military junta imposed martial law and a national curfew and has repealed the constitution. A new and less democratic constitution has been drafted, designed to curb the powers of populist politicians, and will probably be passed in 2015. General elections are expected in 2016 at the earliest. Compared to the turbulence of earlier months, political stability has been restored – at least for the time being. However, the underlying conflict arising from the deep political, social and economic division between the old establishment (royal court, army, judiciary and urban upper class) in the south and the rural poor in the north has yet to be resolved, and is unlikely to disappear soon. Political unrest and uncertainty in 2013 and the first half of 2014, together with poor economic governance, has hit both consumer confidence and international tourism revenues, resulting in very low economic growth since Q2 of 2013. However, the military coup in May 2014 has led to renewed political stability, at the expense of some democratic basic rights such as freedom of assembly, which should support economic growth in 2015. 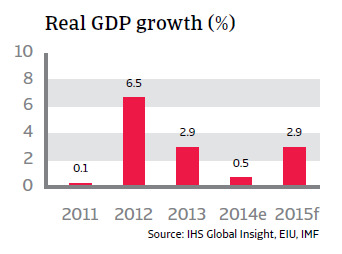 The economy is forecast to have grown 0.5% in 2014, and to increase 2.9% in 2015: still below Thailand´s growth potential. 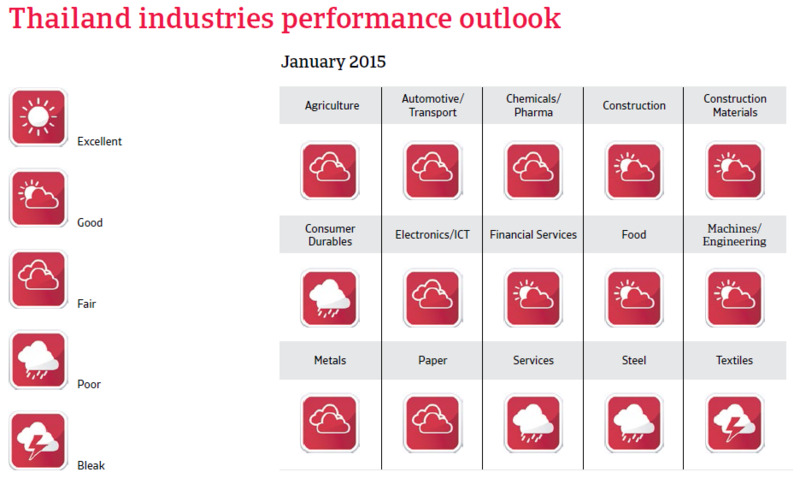 Inflation is expected to remain low in 2015 (at 1.5%), giving the central bank´s monetary policy room for accommodation (i.e. keeping the benchmark interest rate low – currently at 2%). The Thai banking sector is relatively well developed and generally financially healthy, although not comparable to Malaysia and Singapore. The new military junta has stopped the costly and inefficient rice purchase programmes of the former government which proved to be a serious liability for government finances. However, it will continue to implement - and even expand - an extensive infrastructure investment programme worth US $62 billion originally initiated by ousted Prime Minister Yingluck. 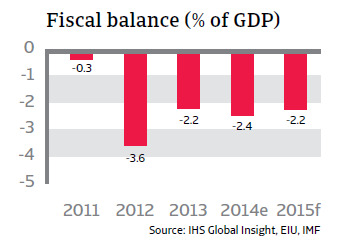 The fiscal deficit is expected to decrease to 2.2% in 2015. A controversial measure by the new military government was the expulsion of thousands of illegal foreign workers, and this is expected to hurt some labour intensive sectors like construction and fishery. This action has also strained relationships with some neighbouring countries, including Cambodia and Myanmar. The exchange rate is resilient to volatility triggered by further political uncertainty. 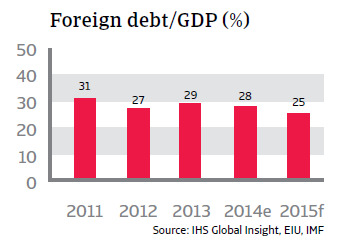 The country´s payment capacity and liquidity are underpinned by low foreign debt (in 2015: 25% of GDP and 35% of exports, with short-term debt amounting to 32% of GDP). International reserves are forecast to total around eight months of import cover in 2015. 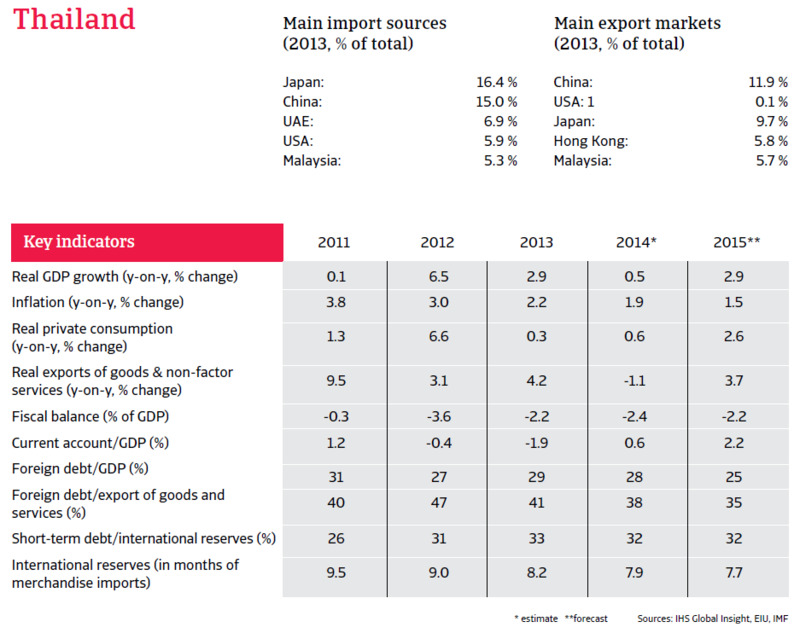 Thailand´s open and exportoriented economy is expected to benefit from a modest global recovery this year. The political situation is likely to remain stable, for at least the coming 12 months and this will certainly help to improve international investors’ sentiment and will encourage more international tourist arrivals.